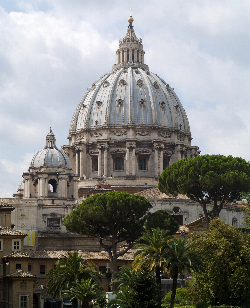 Regarding the lifting of the excommunications, is communion with Rome partially complete? Now, if, with these words, they want to say that the Society is not yet in perfect standing, that is, that there are certain dispositions of Canon Law which are not fulfilled in our present situation, that’s true. But that has nothing to do with communion. That has to do with Canon Law and discipline. What about problems with the dioceses? Do you see there being an eventual canonical resolution? The only reasonable solution I can see for the Society— not for now, but in the future, when there will come a time to reach a canonical agreement—would be, if there were an agreement, to get, at the same time, an exemption from the dioceses. If we are placed, for our apostolate, into the hands of the bishops, for the time being, it is not going to work. They are too many who look at us as enemies, and will treat us as enemies, and that would make our apostolate impossible. That’s not going to work; so for us, the only reasonable way would be a kind of exemption. What does it mean “to be protected”? This phrase comes directly from the pope. 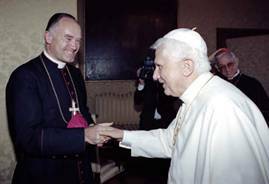 I told him, during the audience I had in 2005, that the present situation of the Church is such that normal Catholic life has been made impossible. The pope said: “I understand that you need protection.” That means he understands that, if he grants us a status, at the same time, he needs to give us a shield, a protection, a wall, something which will prevent those who are enemies of Tradition from demolishing our work. For the time being they are very powerful. I don’t know how this will work, if it will work, or when it will work, but if the pope is not behind us, there is definitely no way we can move ahead. Regarding the discussions with the Vatican, are they “negotiations”? I don’t like that word because, in fact, there is no negotiation. If you negotiate, you are talking about making deals; you have something where you say “OK, I am ready to cut my position down, to make it shorter, I will drop something, I will make a concession.” We aren't talking about making concessions. We are just talking about the Church recognizing its own Tradition. All that we are, we are only because we follow what the Church has commanded, ordered, and believed. It’s the Church’s own patrimony which we have, which we are eager to see the Church share. It’s the Church’s doing, not ours; and we say to the Church: this is yours, take it, make it yours again. I don’t see any kind of negotiation at this level. I only see a “You take it or not.” And I don’t call that a negotiation. Could we consider them a dialogue of the deaf? I don’t think so. It would be if there were no points of understanding. If, let’s say, those with whom we talk had a totally corrupt modern philosophy, for example, totally different modernist concepts, then you could say that it’s like a dialogue of the deaf. But at least the people with whom we discuss are not like that. Maybe they don’t want to discuss, or maybe they don’t want to discuss the same way we do, and maybe the purposes of these discussions aren’t the same on both sides. But I don’t think it’s a dialogue of the deaf for the time being. We shall see. We are still at the beginning of these talks. For the time being we really have the impression that they understand very well what we say. And if they understand, that means they are not deaf. And we also understand what they say. I don’t say that we agree, but I wouldn’t say that it is a dialogue of the deaf.